Undersized but hard-hitting middle linebacker from Baylor was selected by Bears in second round of 1981 draft after Bears traded up with San Francisco. 49er coach Bill Walsh later regretted the trade. Known for breaking helmets with his hard hits. Became a starter midway through his rookie season despite defensive coordinator Buddy Ryan's notorious hatred for rookies. 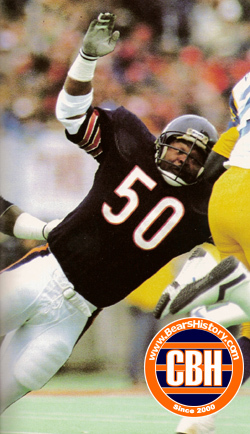 Went on to start more games (172) than any other defensive player in Bears history. Named NFL Defensive Player of the Year in 1985 and 1988, became the quarterback and brains of Ryan's 46 defense, as well as the leader of Vince Tobin's units from 1986-1992. Career ended on a down note when Bears finished 5-11 in 1992. Described his career as a bell curve, starting with the team in disarray, climaxing in 1985, and going down again at the end. Elected to the Pro Football Hall of Fame in 1998. Told the Bears he wanted to get into coaching in 2002 but was told the team didn't need his services. Went on to coach linebackers for Baltimore, then San Francisco, named 49ers Head Coach in 1998.